UK domain registrar Nominet has now sold over six million .co.uk domain names. The milestone was reached when a domain name was sold to Tony Hunt, a builder from Merseyside, according to Nominet. 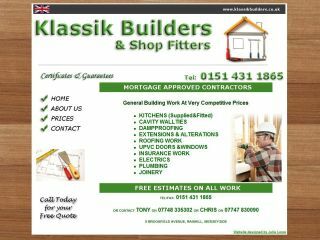 The wonderfully spelt and, er, retro-designed klassikbuilders.co.uk was registered by the tradesman, who is quoted as saying: "I found that not having a website was restricting the growth of my business. These days people go straight to the internet to find information - even if they are just looking for a local builder." Nominet says the continued increase in .co.uk registrations indicates that British internet users think that having a .co.uk address is better than a .com. It cites the case of a recent 2,324 user-strong YouGov survey that demonstrated domain purchasers were six times more likely to choose a .uk rather than .com address when looking for information via an internet search engine.